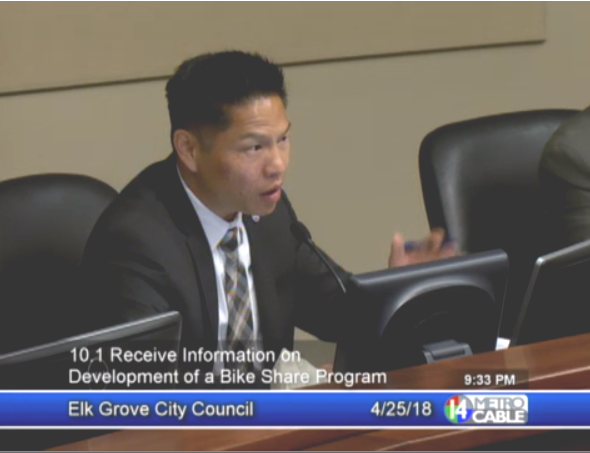 Saying the time was not right, the Elk Grove City Council decided not to further pursue a bicycle sharing plan in the city. The decision was made at the Wednesday, April 25 meeting. The various proposals presented to the council by the city's transit manager Roberta Costa. An examination of a possible program was initiated after the council instructed staff to look into the possibility one year ago when the Sacramento Area Council of Governments (SACOG) undertook a similar study called the Tower Bridge Program for downtown Sacramento. In his report, Costa noted most of the current bike shares programs nationally are in dense urban areas. The programs, he said are either dock based model where bicycles are domiciled at a particular point or a dockless model where bicycles can be left anyplace. The efforts of Lime Bike were suspended because the City of Sacramento adopted an ordinance where all rental bicycles would need to be able to be locked to any existing bike rack. Lime Bike and another company called Spin withdrew because of costs which affected their efforts to offer service is less urbanized areas of Sacramento County. Costa said SACOG is not looking to expand its current roster beyond Sacramento, West Sacramento, and Davis. Given that Lime Bike has withdrawn from the region and Costa said to other companies who expressed some interest would require a city subsidy that could cost up to $50,000 annually. Responding to council questions, Costa said other suburban city's similar to Elk Grove that had programs were associated with significant transportation hubs. Among those are communities that are college towns or have tourist attractions. "In terms of a community that is strictly suburban, we haven't quite seen that," Costa said. "I think some of the concerns that vendors expressed to us was especially when the city of Sacramento enacted their ordinance." Vice Mayor Darren Suen, who has been advocating for several transportation programs in the city, led off deliberations. Suen noted that while the idea might not be well-suited for Elk Grove, it is something that should be looked at for the future. "I believe that we should be innovate and don't be afraid to try things out, and if we fail, fail quickly and move on," he said. "That's kinda what being on the front end, pioneering on some of these things is about." Suen went on to say after the completion of the civic center, and the swimming pool is completed, that could act as a central point for bicycle sharing. Additionally, he noted that traffic along Elk Grove Boulevard, which will be adjacent to the new Costco store and the civic center, is going to see traffic problems worsen. "Here's the thing folks - Elk Grove Boulevard is going to get real crowded, Costco gets built up, when that shopping center gets built around Costco," he said. "The folks that are living directly around that area would benefit greatly by not having to jump in their cars." 12:40 p.m. Lime Bike was mistakenly identified as Line Bike in original posting. What does Darren Suen think people are going to do, bike to Costco and shop? Better have some very large baskets on the front of the bikes for cases of toilet paper. And who is to blame for causing the increased traffic? Despite the opposition from homeowners who live in that area of the city, it is the Elk Grove City Council themselves who are culpable here for approving the Costco in that location in the first place. Now they want to mitigate the problem they created with bicycles! That is rich! Sounds like Suen took a page out of Hume's playbook, where you vote to approve something, then out of the other side of his mouth he makes a subtle comment about the other side of the issue too. This way he has both bases covered, supported the developer, and when the scheisse hits the fan and the natives rebel, he can draw from his other comment to pacify them. I thought I would comment, but actually I'm at a loss for words regarding this topic. All I can say is it looks like there's a lot of "busywork" going on at City Hall! Just throw this one on top of that Feasibility Study stack. That's it D.J....talking out of both sides of their mouth or as I always accused my EX of...suffering from the "indecisive syndrome". This can be paralyzing & costly for us, time to set dynamite to it!